The surgical options, facility flexibility and helping hands at Columbia Surgical Associates are here for you to help get you back to living well. State of the art care tailored for every patient. Board Certified, dedicated surgical specialists committed to excellence. Just a click, call or few steps away. Contact us today. COLUMBIA SURGICAL ASSOCIATES, for more than 55 years, the surgeons and staff at Columbia Surgical Associates have been providing quality care to people throughout Mid-Missouri. 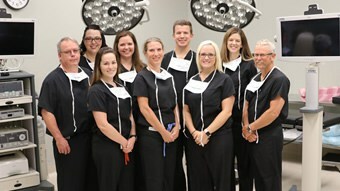 When it comes to providing excellent surgical care, experience matters, and the board-certified specialists at Columbia Surgical Associates offer patients the benefit of over 100 years of combined experience with the best possible care in Mid-Missouri. We specialize in the surgical treatment of a variety of health problems and concerns, including diseases of the breast, gallbladder and intestinal tract, benign and malignant tumors, hernias, vascular diseases and weight loss. We’re committed to practicing the latest in comfort-oriented surgery and advancing medical science through education and exploration. But when it comes down to it, we know it’s not enough for your surgeon to be the most skilled. You also need your surgeon to be the most compassionate. Discover what it’s like to experience both at once — at Columbia Surgical Associates.